Luca Pitti (1398–1472) began work on the palazzo in 1458. The construction of this severe and forbidding building was commissioned in 1458 by the Florentine banker Luca Pitti (1398-1472), a principal supporter and friend of Cosimo de' Medici. The early history of the Palazzo Pitti is a mixture of fact and myth. Pitti is alleged to have instructed that the windows be larger than the entrance of the Palazzo Medici. The 16th-century art historian Giorgio Vasari proposed that Brunelleschi was the palazzo's architect, and that his pupil Luca Fancelli was merely his assistant in the task, but today it is Fancelli who is generally credited. Besides obvious differences from the elder architect's style, Brunelleschi died 12 years before construction of the palazzo began. The design and fenestration suggest that the unknown architect was more experienced in utilitarian domestic architecture than in the humanist rules defined by Alberti in his book De Re Aedificatoria. Though impressive, the original palazzo would have been no rival to the Florentine Medici residences in terms of either size or content. Whoever the architect of the Palazzo Pitti was, he was moving against the contemporary flow of fashion. The rusticated stonework gives the palazzo a severe and powerful atmosphere, reinforced by the three-times-repeated series of seven arch-headed apertures, reminiscent of a Roman aqueduct. The Roman-style architecture appealed to the Florentine love of the new style all'antica. This original design has withstood the test of time: the repetitive formula of the façade was continued during the subsequent additions to the palazzo, and its influence can be seen in numerous 16th-century imitations and 19th-century revivals. Work stopped after Pitti suffered financial losses following the death of Cosimo de' Medici in 1464. Luca Pitti died in 1472 with the building unfinished. The building was sold in 1549 by Buonaccorso Pitti, a descendant of Luca Pitti, to Eleonora di Toledo. Raised at the luxurious court of Naples, Eleonora was the wife of Cosimo I de' Medici of Tuscany, later the Grand Duke. On moving into the palace, Cosimo had Vasari enlarge the structure to fit his tastes; the palace was more than doubled by the addition of a new block along the rear. Vasari also built the Vasari Corridor, an above-ground walkway from Cosimo's old palace and the seat of government, the Palazzo Vecchio, through the Uffizi, above the Ponte Vecchio to the Palazzo Pitti. This enabled the Grand Duke and his family to move easily and safely from their official residence to the Palazzo Pitti. Initially the Palazzo Pitti was used mostly for lodging official guests and for occasional functions of the court, while the Medicis' principal residence remained the Palazzo Vecchio. It was not until the reign of Eleonora's son Francesco I and his wife Johanna of Austria that the palazzo was occupied on a permanent basis and became home to the Medicis' art collection. Land on the Boboli hill at the rear of the palazzo was acquired in order to create a large formal park and gardens, today known as the Boboli Gardens. The landscape architect employed for this was the Medici court artist Niccolò Tribolo, who died the following year; he was quickly succeeded by Bartolommeo Ammanati. The original design of the gardens centred on an amphitheatre, behind the corps de logis of the palazzo. The first play recorded as performed there was Andria by Terence in 1476. It was followed by many classically inspired plays of Florentine playwrights such as Giovan Battista Cini. Performed for the amusement of the cultivated Medici court, they featured elaborate sets designed by the court architect Baldassarre Lanci. With the garden project well in hand, Ammanati turned his attentions to creating a large courtyard immediately behind the principal façade, to link the palazzo to its new garden. This courtyard has heavy-banded channelled rustication that has been widely copied, notably for the Parisian palais of Maria de' Medici, the Luxembourg. In the principal façade Ammanati also created the finestre inginocchiate ("kneeling" windows, in reference to their imagined resemblance to a prie-dieu, a device of Michelangelo's), replacing the entrance bays at each end. During the years 1558–70, Ammanati created a monumental staircase to lead with more pomp to the piano nobile, and he extended the wings on the garden front that embraced a courtyard excavated into the steeply sloping hillside at the same level as the piazza in front, from which it was visible through the central arch of the basement. On the garden side of the courtyard Amannati constructed a grotto, called the "grotto of Moses" on account of the porphyry statue that inhabits it. On the terrace above it, level with the piano nobile windows, Ammanati constructed a fountain centered on the axis; it was later replaced by the Fontana del Carciofo ("Fountain of the Artichoke"), designed by Giambologna's former assistant, Francesco Susini, and completed in 1641. In 1616, a competition was held to design extensions to the principal urban façade by three bays at either end. Giulio Parigi won the commission; work on the north side began in 1618, and on the south side in 1631 by Alfonso Parigi. During the 18th century, two perpendicular wings were constructed by the architect Giuseppe Ruggeri to enhance and stress the widening of via Romana, which creates a piazza centered on the façade, the prototype of the cour d'honneur that was copied in France. Sporadic lesser additions and alterations were made for many years thereafter under other rulers and architects. To one side of the Gardens is the bizarre grotto designed by Bernardo Buontalenti. The lower façade was begun by Vasari but the architecture of the upper storey is subverted by "dripping" pumice stalactites with the Medici coat of arms at the centre. The interior is similarly poised between architecture and nature; the first chamber has copies of Michelangelo's four unfinished slaves emerging from the corners which seem to carry the vault with an open oculus at its centre and painted as a rustic bower with animals, figures and vegetation. Figures, animals and trees made of stucco and rough pumice adorn the lower walls. A short passage leads to a small second chamber and to a third which has a central fountain with Giambologna's Venus in the centre of the basin, peering fearfully over her shoulder at the four satyrs spitting jets of water at her from the edge. The palazzo remained the principal Medici residence until the last male Medici heir died in 1737. It was then occupied briefly by his sister, the elderly Electress Palatine; on her death, the Medici dynasty became extinct and the palazzo passed to the new Grand Dukes of Tuscany, the Austrian House of Lorraine, in the person of Francis I, Holy Roman Emperor. The Austrian tenancy was briefly interrupted by Napoleon, who used the palazzo during his period of control over Italy. 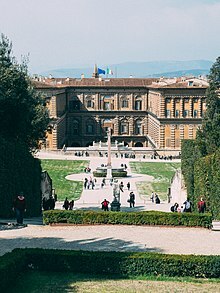 When Tuscany passed from the House of Lorraine to the House of Savoy in 1860, the Palazzo Pitti was included. After the Risorgimento, when Florence was briefly the capital of the Kingdom of Italy, Victor Emmanuel II resided in the palazzo until 1871. His grandson, Victor Emmanuel III, presented the palazzo to the nation in 1919. The palazzo and other buildings in the Boboli Gardens were then divided into five separate art galleries and a museum, housing not only many of its original contents, but priceless artefacts from many other collections acquired by the state. The 140 rooms open to the public are part of an interior, which is in large part a later product than the original portion of the structure, mostly created in two phases, one in the 17th century and the other in the early 18th century. Some earlier interiors remain, and there are still later additions such as the Throne Room. In 2005 the surprise discovery of forgotten 18th-century bathrooms in the palazzo revealed remarkable examples of contemporary plumbing very similar in style to the bathrooms of the 21st century. Cornice of the Jupiter Room, showing lunette frescoes and stucco work by Pietro da Cortona. The Palatine Gallery, the main gallery of Palazzo Pitti, contains a large ensemble of over 500 principally Renaissance paintings, which were once part of the Medicis' and their successors' private art collection. The gallery, which overflows into the royal apartments, contains works by Raphael, Titian, Perugino (Lamentation over the Dead Christ), Correggio, Peter Paul Rubens, and Pietro da Cortona. The character of the gallery is still that of a private collection, and the works of art are displayed and hung much as they would have been in the grand rooms for which they were intended rather than following a chronological sequence, or arranged according to school of art. The finest rooms were decorated by Pietro da Cortona in the high baroque style. Initially Cortona frescoed a small room on the piano nobile called the Sala della Stufa with a series depicting the Four Ages of Man which were very well received; the Age of Gold and Age of Silver were painted in 1637, followed in 1641 by the Age of Bronze and Age of Iron. They are regarded among his masterpieces. The artist was subsequently asked to fresco the grand ducal reception rooms; a suite of five rooms at the front of the palazzo. In these five Planetary Rooms, the hierarchical sequence of the deities is based on Ptolomeic cosmology; Venus, Apollo, Mars, Jupiter (the Medici Throne room) and Saturn, but minus Mercury and the Moon which should have come before Venus. These highly ornate ceilings with frescoes and elaborate stucco work essentially celebrate the Medici lineage and the bestowal of virtuous leadership. 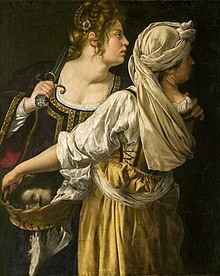 Cortona left Florence in 1647, and his pupil and collaborator, Ciro Ferri, completed the cycle by the 1660s. They were to inspire the later Planet Rooms at Louis XIV's Versailles, designed by Le Brun. The collection was first opened to the public in the late 18th century, albeit rather reluctantly, by Grand Duke Leopold, Tuscany's first enlightened ruler, keen to obtain popularity after the demise of the Medici. Room of Castagnoli: named after the painter of the ceiling frescoes. In this room are exposed Portraits of the Medici and Lorraine ruling families, and the Table of the Muses, a masterwork of stone-inlaid table realized by the Opificio delle Pietre Dure between 1837 and 1851. Room of the Ark: contains a painting by Giovan Battista Caracciolo (17th century). In 1816, the ceiling was frescoed by Luigi Ademollo with Noah entering Jerusalem with the Ark. Room of Psyche: was named after ceiling frescoes by Giuseppe Collignon; it contains paintings by Salvator Rosa from 1640–1650. Hall of Poccetti: The frescoes on the vault were once ascribed to Bernardino Poccetti, but now attributed to Matteo Rosselli. In the center of the hall is a table (1716) commissioned by Cosimo III. In the hall are also some works by Rubens and Pontormo. Room of Prometheus: was named after the subject of the frescoes by Giuseppe Collignon (19th century) and contains a large collection of round-shaped paintings: among them is the Madonna with the Child by Filippino Lippi (15th century), two portraits by Botticelli and paintings by Pontormo and Domenico Beccafumi. Room of Justice: has a ceiling frescoed by Antonio Fedi (1771–1843), and displays portraits (16th century) by Titian, Tintoretto and Paolo Veronese. Room of Ulysses: was frescoed in 1815 by Gaspare Martellini, it contains early works by Filippino Lippi and Raphael. Room of Iliad: contains the Madonna of the Family Panciatichi and the Madonna Passerini (c- 1522-1523 and 1526 respectively) by Andrea del Sarto, and paintings by Artemisia Gentileschi (17th century). Room of Saturn: contains a Portrait of Agnolo Doni (1506), the Madonna of the chair(1516), and Portrait of Cardinal Inghirami (1516) by Raphael; it also contains an Annunciation(1528) by Andrea del Sarto, and Jesus and the Evangelists (1516) by Fra Bartolomeo. Room of Mars: is characterized by works by Rubens: the allegories representing the Consequences of War (hence the name of the room) and the Four Philosophers (among them Rubens portrayed himself, on the left). On the vault is a fresco by Pietro da Cortona, Triumph of the Medici. Room of Apollo: contains a Madonna with Saints (1522) by Il Rosso, originally from the Church of Santo Spirito, and two paintings by Titian: a Magdalen and Portrait of an English Nobleman (between 1530 and 1540). Room of Venus: contains the Venere Italica (1810) by Canova commissioned by Napoleon. On the walls are landscapes (1640–50) by Salvator Rosa and four paintings by Titian, 1510–1545. 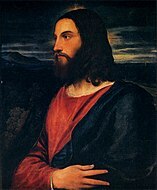 Among the Titian paintings is a Portrait of Pope Julius II (1545) and La Bella (1535). White Hall: once the ball room of the palace, is characterized by the white decorations and is often used for temporary exhibitions. The Royal Apartments include 14 rooms. Their decoration has been changed to Empire style by the Savoy, but there are still some rooms maintaining decorations and furniture from the age of the Medici. The Green Room, was frescoed by Giuseppe Castagnoli in early 19th Century. It exhibits an Intarsia Cabinet from the 17th century and a Collection of Gilded Bronzes; the Throne Room was decorated for King Vittorio Emanuele II of Savoy and is characterized by the red brocate on the walls and by the Japanese and Chinese Vases (17th-18th century). The Blue Room contains collected Furniture (17th-18th century) and the Portraits of members of the Medici Family painted by Justus Sustermans (1597–1681). The Granduca Madonna. 84 x 55 cm. Madonna of the Canopy. 276 x 224 cm. Portrait of Agnolo Doni. 63 x 45 cm. Woman with a Veil. 82 x 60 cm. 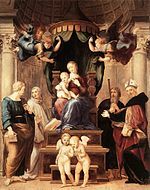 Madonna della Seggiola. Diameter 71 cm. Vision of Ezekiel. 41 x 30 cm. Portrait of Tommaso Inghirami. 90 x 62 cm. Madonna dell'Impannata. 158 x 125 cm. La Donna Gravida. 66 x 52 cm. Christ the Redeemer. 78 x 55 cm. The Concert. 87 x 124 cm. Isabella d'Este. 100 x 75 cm. Portrait of Vicenzo Monti. 85 x 67 cm. Portrait of Pope Julius II. 99 x 82 cm. Mary Magdalene. 84 x 69 cm. The Four Philiosophers. 167 x 143 cm. The Consequences of War. 206 x 342 cm. The Holy Family. 114 x 80 cm. Fra Antonio Martelli. 118 x 95 cm. Three Ages of Man. 62 x 77 cm. St. Jerome. 41 x 27 cm. Sleeping Cupid. 72 x 105 cm. Gentleman in a Lynx Fur. 140 x 107 cm. Lamentation. 158 x 199 cm. Pieta with Saints. 239 x 199 cm. This is a suite of 14 rooms, formerly used by the Medici family, and lived in by their successors. These rooms have been largely altered since the era of the Medici, most recently in the 19th century. They contain a collection of Medici portraits, many of them by the artist Giusto Sustermans. In contrast to the great salons containing the Palatine collection, some of these rooms are much smaller and more intimate, and, while still grand and gilded, are more suited to day-to-day living requirements. Period furnishings include four-poster beds and other necessary furnishings not found elsewhere in the palazzo. The Kings of Italy last used the Palazzo Pitti in the 1920s. By that time it had already been converted to a museum, but a suite of rooms (now the Gallery of Modern Art) was reserved for them when visiting Florence officially. Mary Stuart at Crookstone, by Giovanni Fattori, in the Gallery of Modern Art at the Palazzo Pitti. This gallery originates from the remodeling of the Florentine academy in 1748, when a gallery of Modern Art was established. The gallery was intended to hold those art works which were prize-winners in the academy's competitions. The Palazzo Pitti was being redecorated on a grand scale at this time and the new works of art were being collected to adorn the newly decorated salons. By the mid-19th century so numerous were the Grand Ducal paintings of modern art that many were transferred to the Palazzo della Crocetta [it], which became the first home of the newly formed "Modern Art Museum". Following the Risorgimento and the expulsion of the Grand Ducal family from the palazzo, all the Grand Ducal modern art works were brought together under one roof in the newly titled "Modern gallery of the Academy". The collection continued to expand, particularly so under the patronage of Vittorio Emanuele II. However it was not until 1922 that this gallery was moved to the Palazzo Pitti where it was complemented by further modern works of art in the ownership of both the state and the municipality of Florence. The collection was housed in apartments recently vacated by members of the Italian Royal family. The gallery was first opened to public viewing in 1928. Today, further enlarged and spread over 30 rooms, this large collection includes works by artists of the Macchiaioli movement and other modern Italian schools of the late 19th and early 20th centuries. The pictures by the Macchiaioli artists are of particular note, as this school of 19th-century Tuscan painters led by Giovanni Fattori were early pioneers and the founders of the impressionist movement. The title "gallery of modern art" to some may sound incorrect, as the art in the gallery covers the period from the 18th to the early 20th century. No examples of later art are included in the collection since In Italy, "modern art" refers to the period before World War II; what has followed is generally known as "contemporary art" (arte contemporanea). In Tuscany this art can be found at the Centro per l'arte contemporanea Luigi Pecci at Prato, a city about 15 km (9 mi) from Florence. The Silver Museum, sometimes called "The Medici Treasury", contains a collection of priceless silver, cameos, and works in semi-precious gemstones, many of the latter from the collection of Lorenzo de' Medici, including his collection of ancient vases, many with delicate silver gilt mounts added for display purposes in the 15th century. These rooms, formerly part of the private royal apartments, are decorated with 17th-century frescoes, the most splendid being by Giovanni da San Giovanni, from 1635 to 1636. The Silver Museum also contains a fine collection of German gold and silver artefacts purchased by Grand Duke Ferdinand after his return from exile in 1815, following the French occupation. The "Casino del Cavaliere" in the Boboli Gardens now houses the porcelain museum. First opened in 1973, this museum is housed in the Casino del Cavaliere in the Boboli Gardens. The porcelain is from many of the most notable European porcelain factories, with Sèvres and Meissen near Dresden being well represented. Many items in the collection were gifts to the Florentine rulers from other European sovereigns, while other works were specially commissioned by the Grand Ducal court. Of particular note are several large dinner services by the Vincennes factory, later renamed Sèvres, and a collection of small biscuit figurines. Situated in a wing known as the "Palazzina della Meridiana [it]", this gallery contains a collection of theatrical costumes dating from the 16th century until the present. It is also the only museum in Italy detailing the history of Italian fashions. One of the newer collections to the palazzo, it was founded in 1983 by Kirsten Aschengreen Piacenti; a suite of fourteen rooms, the Meridiana apartments, were completed in 1858. In addition to theatrical costumes, the gallery displays garments worn between the 18th century and the present day. Some of the exhibits are unique to the Palazzo Pitti; these include the 16th-century funeral clothes of Grand Duke Cosimo I de' Medici, and his wife Eleonora of Toledo and their son Garzia, both of whom died of malaria. Their bodies would have been displayed in state wearing their finest clothes, before being reclad in plainer attire before interment. The gallery also exhibits a collection of mid-20th century costume jewellery. The Sala Meridiana originally sponsored a functional solar meridian instrument, built into the fresco decoration by Anton Domenico Gabbiani. This ground floor museum exhibits carriages and other conveyances used by the Grand Ducal court mainly in the late 18th and 19th century. The extent of the exhibition prompted one visitor in the 19th century to wonder, "In the name of all that is extraordinary, how can they find room for all these carriages and horses". Some of the carriages are highly decorative, being adorned not only by gilt but by painted landscapes on their panels. Those used on the grandest occasions, such as the "Carrozza d'Oro" (golden carriage), are surmounted by gilt crowns which would have indicated the rank and station of the carriage's occupants. Other carriages on view are those used by the King of the Two Sicilies, and Archbishops and other Florentine dignitaries. The garden facade facing the anfiteatro of the Boboli Gardens. A modern view of the Palazzo Pitti. Today, transformed from royal palace to museum, the Palazzo is in the hands of the Italian state through the "Polo Museale Fiorentino", an institution which administers twenty museums, including the Uffizi Gallery, and has ultimate responsibility for 250,000 catalogued works of art. In spite of its metamorphosis from royal residence to a state-owned public building, the palazzo, sitting on its elevated site overlooking Florence, still retains the air and atmosphere of a private collection in a grand house. This is to a great extent due to the "Amici di Palazzo Pitti" (Friends of the Palazzo Pitti), an organisation of volunteers and patrons founded in 1996, which raises funds and makes suggestions for the ongoing maintenance of the palazzo and the collections, and for the continuing improvement of their visual display. The Königsbau wing ('King's building / den') of the Munich Residenz, the former royal palace in the capital of Bavaria, was modelled after the Palazzo Pitti. ^ Chiarini, Gloria. "Pitti Palace". The Florence Art Guide. Retrieved 2007-01-12. ^ The Iconographic Encyclopedia of the Arts and Sciences. Iconographic Pub. Co., 1888. p. 239. ^ a b Polo Museale Fiorentino (2007). "The Palatine Gallery and Royal Apartments". Polo Museale Fiorentino. Ministero per i Beni e le Attivit Culturali. Archived from the original on 2007-10-09. Retrieved 2008-01-08. ^ Campbell, Malcolm (1977). Pietro da Cortona at the Pitti Palace. A Study of the Planetary Rooms and Related Projects. Princeton University Press. p. 78. ^ Polo Museale Fiorentino (2007). "The Gallery of Modern Art". Polo Museale Fiorentino. Ministero per i Beni e le Attivit Culturali. Archived from the original on 2007-10-09. Retrieved 2008-01-08. ^ Polo Museale Fiorentino (2007). "The "museo degli Argenti" (The Medici Treasury)". Polo Museale Fiorentino. Ministero per i Beni e le Attivit Culturali. Archived from the original on 2007-10-09. Retrieved 2008-01-08. ^ Polo Museale Fiorentino (2007). "The Porcelain museum". Polo Museale Fiorentino. Ministero per i Beni e le Attivit Culturali. Archived from the original on 2007-10-09. Retrieved 2008-01-08. ^ Polo Museale Fiorentino (2007). "The Costume Gallery". Polo Museale Fiorentino. Ministero per i Beni e le Attivit Culturali. Archived from the original on 2007-10-09. Retrieved 2008-01-08. ^ Arnold, Janet (June 1984). "Review: Costumes at Palazzo Pitti. Florence". The Burlington Magazine. 126 (975): 371 + 378. JSTOR 881642. ^ "The Parterre of fiction, poetry, history [&c.]". Oxford University, 1836. p. 144. ^ Polo Museale Fiorentino (2007). "Welcome". Polo Museale Fiorentino. Ministero per i Beni e le Attivit Culturali. Archived from the original on 2007-10-30. Retrieved 2008-01-08. ^ "About us". Amici di Palazzo Pitti. Archived from the original on 2007-07-31. Retrieved 2007-01-12. Masson, Georgina (1959). Italian Villas and Palaces. London: Harry N. Abrams Ltd.
Gurrieri, Francesco; Patrizia Fabbri, (photography Stefano Giraldi) (1996). Palaces of Florence. Rizzoli. pp. 66–77. Wikimedia Commons has media related to Palazzo Pitti. Wikisource has the text of the 1905 New International Encyclopedia article Pitti Palace.